This month was full of creative inspiration through story-telling, mosaics, and dragon puppets; it's safe to say we ended 2017 on a high-note! Earlier this month, we held our 38th annual reading and celebration of this year's anthology, This Bursting Sound Within. 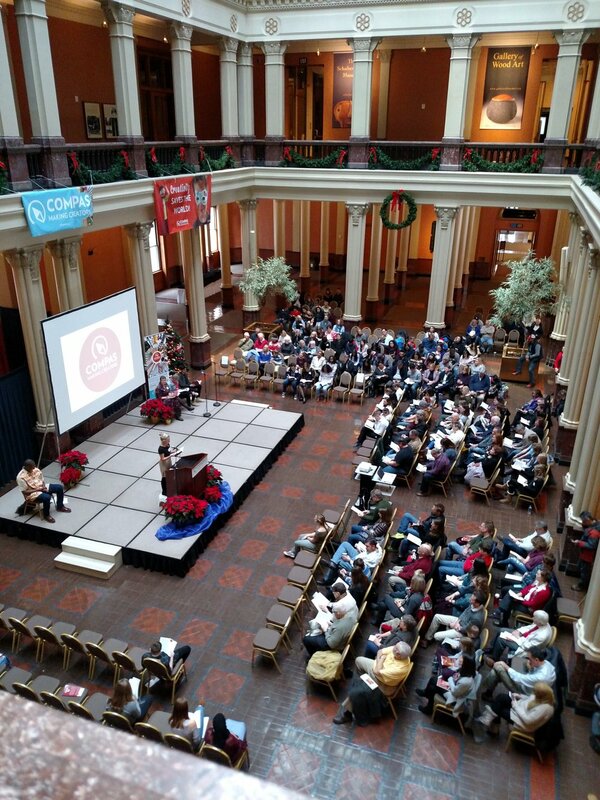 82 Minnesota K-12 students became first-time published authors and over half of them were able to attend this event! The book features work from each Minnesota school that hosted a COMPAS teaching writer-in-residence during the 2016-2017 school year as part of the Creative Classroom program. All students were invited to read their pieces aloud for close to 300 family, friends, teachers and COMPAS Teaching Artists that attended. Check out our recap on this event here! Visual artist Malia Burkhart visited Hilltop Elementary this month to work with students K-3 on a large-scale dragon puppet. Malia has been a master-puppeteer for almost twenty years now! "Not only did the fourth-graders work in teams to envision and design their dragons, they choreographed steps/dances and composed a beat for the parade,” said Hilltop art teacher Klair Hans. Read more about this incredible project in the Westonka News newsletter. Check out more stories and quotes from individuals who were transformed through the power of writing and storytelling. Are you ready to keep the creative momentum going? A contribution of any size is what continues to cultivate stories like these. You're giving the power of healing through art and we're looking forward to continuing this movement throughout the new year. Cheers to unleashing more creators in 2018!